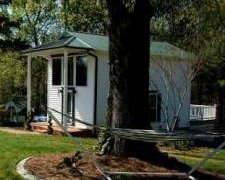 Aquilla Creek Cottage is located in East Bend, North Carolina, in the rural Yadkin Valley wine country. This destination rental is a renovated historic building that was once part of the I.C. Shore Distillery and then a tobacco pack house. 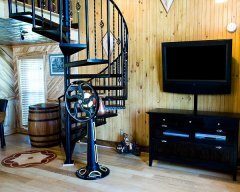 It is situated in the heart of North Carolina's world class wine production area. We pride ourselves in creating a tranquil atmosphere that allows our guests to create memories that will be treasured for years to come. Our comfortable cottage promotes true relaxation. From the moment you check in, you will find your accommodations at Aquilla Creek Cottage a relaxing place to rejuvenate your senses. Our careful attention to detail and the natural beauty of the area promote a feeling of relaxed elegance. Add extra touches to your stay by choosing a shuttle for your Yadkin Valley wine tour or a massage. Or if you're feeling like an adventure, take a hot air balloon ride. We strive to make your North Carolina Wine Country get-away as special as you want it to be. 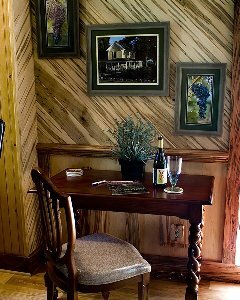 From Aquilla Creek Cottage, you can explore the many attractions of the Yadkin Valley by car or shuttle service to local vineyards. Flint Hill Vineyards, Divine Llama, and Cellar 4201 are only minutes from the cottage, with RagApple Lassie Winery and Sanders Ridge only a short drive, along with numerous other vineyards within an hour's drive. Kitchen Roselli's, East Bend's fine Italian cuisine, is only a short drive up the road. We are 20 minutes from Winston-Salem, North Carolina, for shopping, dining, and night life. We are centrally located to numerous rural bike routes. So bring along your bike. Whether you desire winery touring biking, golfing, hiking, or shopping, you will find the best of Yadkin Valley accommodations, here at Aquilla Creek Cottage. We look forward to seeing you soon at Aquilla Creek Cottage. We loved the beautiful cottage and the tranquil country setting. The attention to detail was outstanding. Love all of the woodwork! Definitely will be back again! Mild winters, brilliantly blooming springs, comfortable summers, and colorful falls. Any season is a great season to visit Aquilla Creek Cottage. From the moment you check in, you will find your accommodations at Aquilla Creek Cottage a relaxing place to rejuvenate your senses. What's happening in Yadkin Valley? The Yadkin Valley has become renowned for it's world class wineries. Nearby Winston-Salem is a center for the arts, history, and fine dining.